Founded in 1979, Hollis Taggart—formerly known as Hollis Taggart Galleries—presents significant works of American art, showcasing the trajectory of American art movements from the Hudson River School to American Modernism and Post-War and Contemporary eras. Its program is characterized by a deep commitment to scholarship and bringing to the fore the work of under-recognized artists. The gallery has sponsored several catalogue raisonné projects, most recently for Surrealist artist Kay Sage, and has been instrumental in advancing knowledge of such compelling artists as Alfred Maurer, Arthur B. Carles, and more recently, Theodoros Stamos, Marjorie Strider and Michael (Corinne)West. 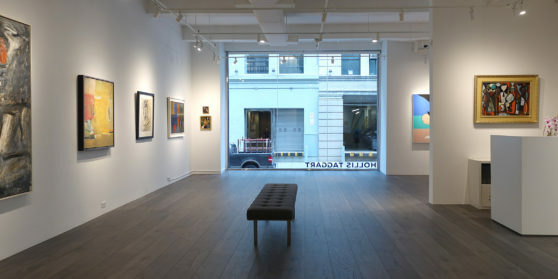 In summer 2015, the gallery moved its primary location from the Upper East Side to Chelsea. In fall 2018, it opened a newly renovated street-level location on W. 26th Street, a private viewing and storage annex across the street, and a project space at the High Line. With 40 years of experience, Hollis Taggart is widely recognized by collectors and curators for its leadership, expertise, and openness, on matters of art history, and market trends and opportunities.